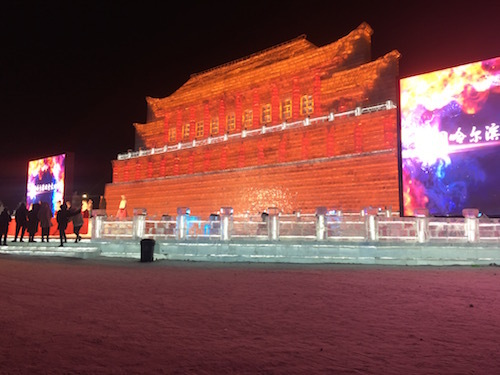 The first time I heard about Harbin was during a Chinese lesson on weather about two months ago. My teacher had me read out the new vocabulary list. “Ice light,” my teacher said. “Yes.” She looked at the book to see if she was translating incorrectly. “Oh, ice lantern,” she repeated, looking at me expectantly as if this correction would help. “I don’t know what an ice lantern is,” I told her. I shook my head. 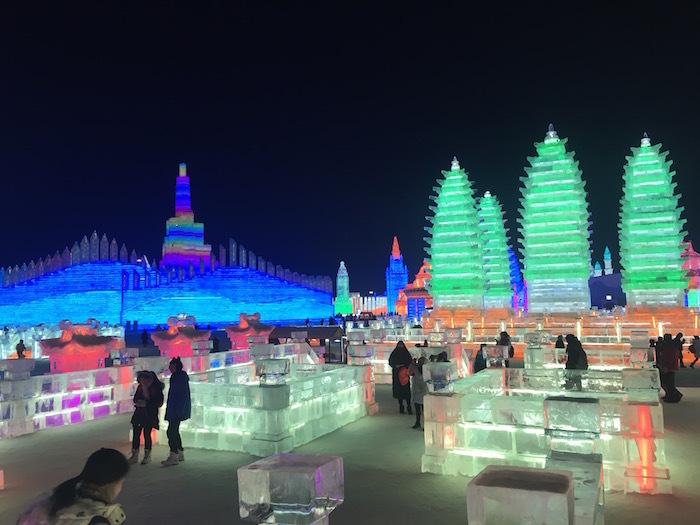 My teacher then produced photos of some of the most spectacular ice sculptures I’ve ever seen lit up with multi-colored lights. 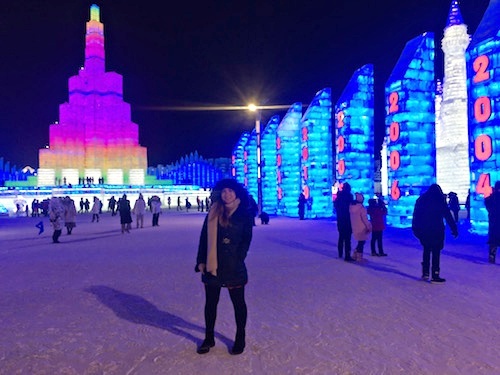 She told me this city in the north (Harbin) hosts an ice festival every year in January but it’s horribly cold, around -30C. I lived in Chicago for two years. I can do -30C if it means seeing pretty lights. It was one of those experiences that just sounds crazy enough it excites me. 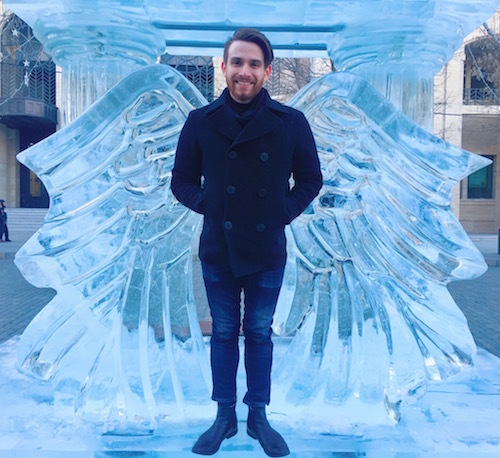 Luckily, one of my friends and I started talking about the ice festival and he told me he wanted to go too. He’s been studying China/Chinese for years so I figured he’d be a good guide. 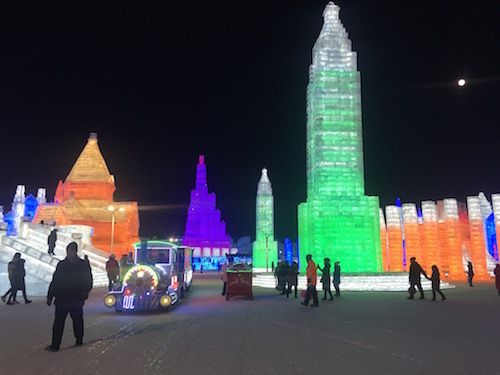 I requested off a vacation day and we took a 3-day long weekend to Harbin. 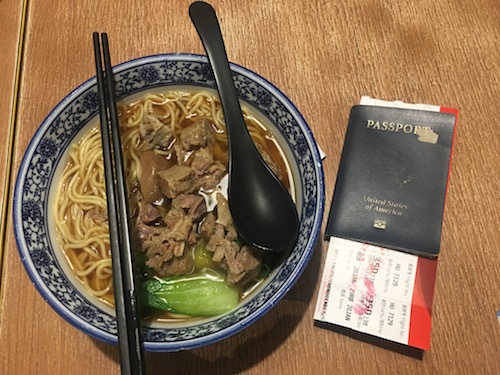 Our flight left Beijing really early which meant getting up at 4 am and having overpriced and not very good noodles for breakfast in the airport. 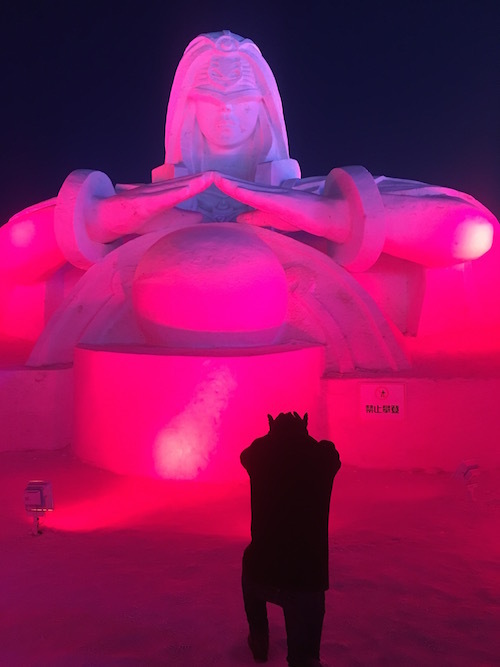 We got to Harbin in the morning and were pleasantly surprised it was only -8C. Not nearly as bad as we were expecting. 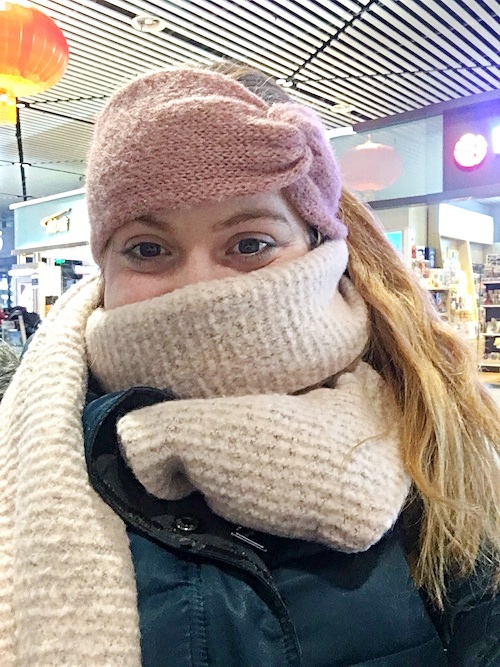 Upon arriving, I had added a few layers of clothing and could barely walk I was so wrapped up. We got a cab from the airport which drove us into the city and walked around briefly before checking into our AirBnB. 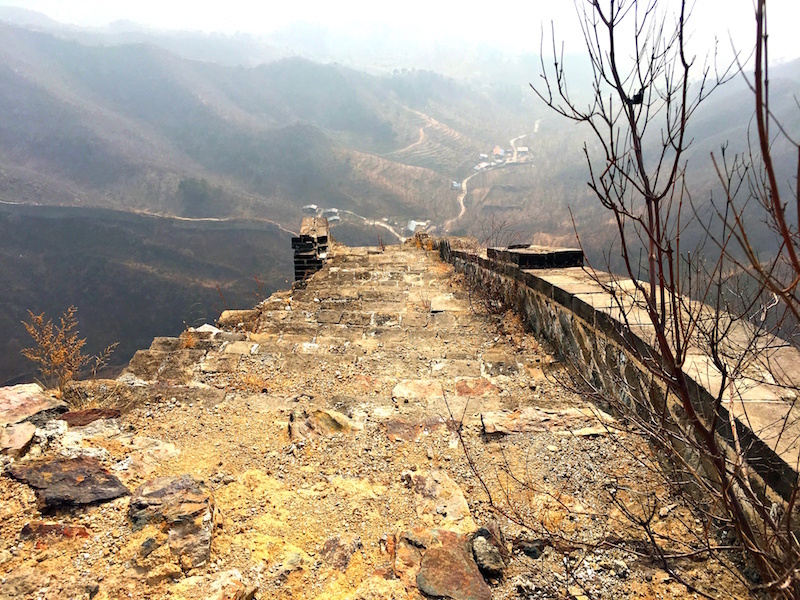 At first, I wasn’t convinced Harbin was going to be a success. My first impression was that it was boring and dull. I commented that, if the signs weren’t in Chinese, Harbin could have been any random city in the world. Our AirBnB was really nice. 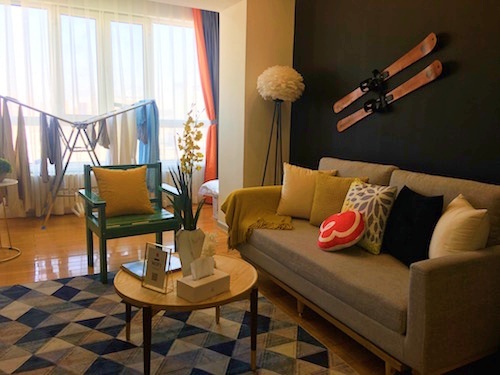 Rent is high in Beijing so we were excited to have such a nice apartment for so cheap. 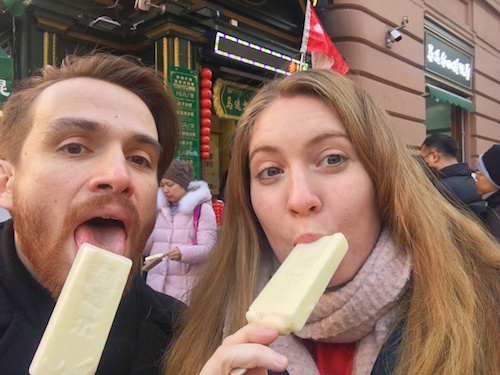 Since neither of us slept much the night before, we pretty much got to Harbin and crashed for most of the afternoon. Best nap I’ve ever had! Maybe I’m getting old, but a big highlight of that trip was the bed. 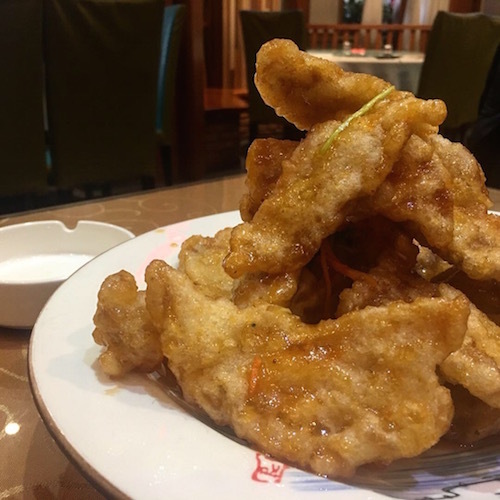 The northeastern provinces are known for their heavy food, especially BBQ. That night, we went to a BBQ restaurant Antonio found on Chinese Yelp. Thank God he was with me or I wouldn’t have been able to order anything. 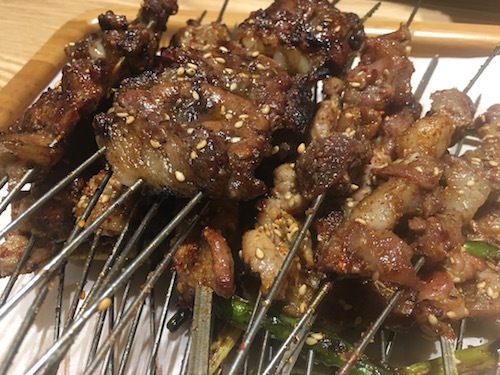 He translated the menu for us and ordered a whole pile of various meats on skewers which were all covered in a tasty seasoning. We had chicken, pork, ribs, various cuts of beef, and potatoes. Some items didn’t translate into English well. We ordered the “golden stick of one” out of sheer curiosity and were relieved when it was just corn on a skewer. A major theme of this weekend was Antonio forcing me to eat tons of heavy meat and me moaning in physical pain from how much we ate. And then Antonio planning our next meals days in advance. 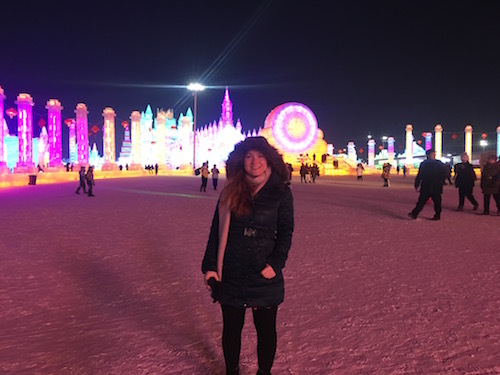 Our first night, we walked around Harbin in the cold and it looked so desolate as if we were visiting after the apocalypse or something. The next day we went to the main pedestrian street which was beautiful. I felt a lot better about Harbin after that. The street was lined with ice sculptures and street vendors and was much livelier than where we were walking the night before. 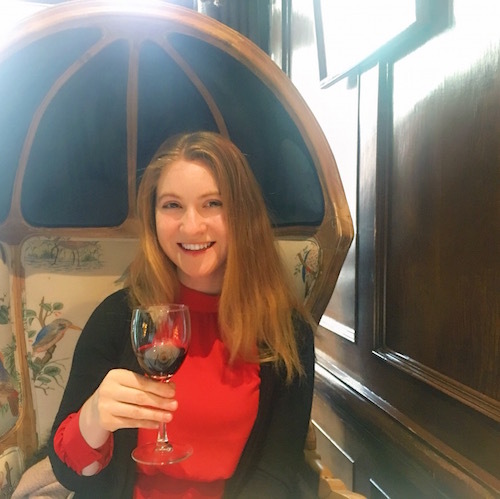 First, we went to a Russian restaurant but when all the Chinese waiters were wearing cowboy hats, we decided to go to a different place. 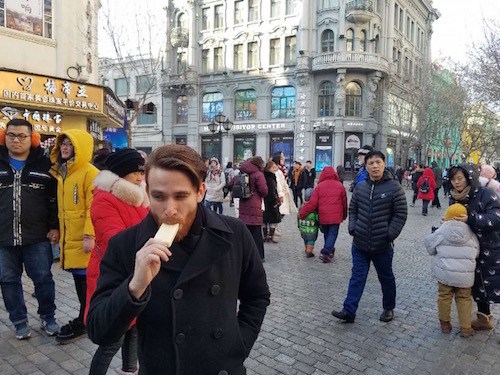 After lunch, Antonio told me that Harbin is famous for these creamy popsicles they sell on the street. 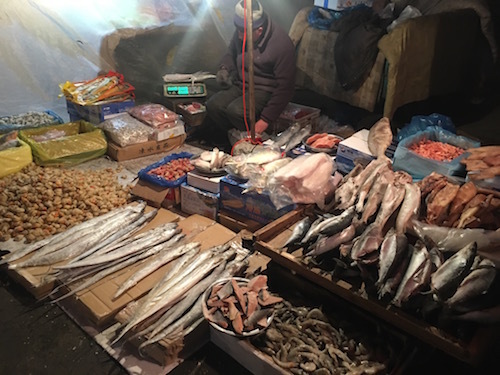 Despite it being far below freezing, we indulged. Fun warning: eating something cold in those temperatures is dangerous. If you aren’t careful, the insides of your lips will stick to the ice. We realized this when I went to take a picture and Antonio’s popsicle was covered in blood from where he ripped it off his lips. 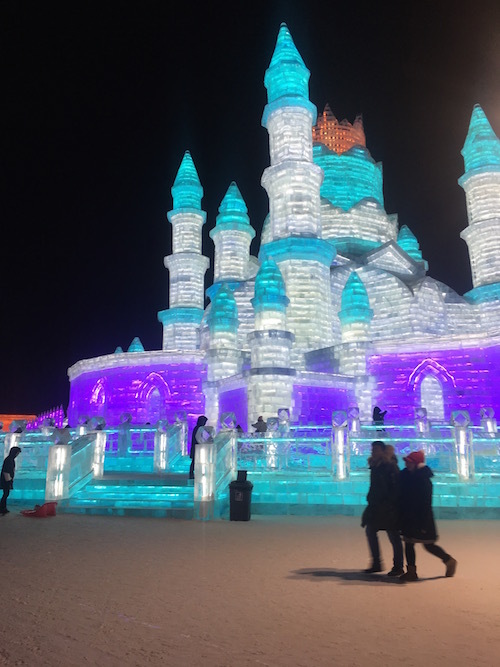 At night, the streets and ice sculptures are all lite up and it’s very magical. Both our phones died in the cold so we spent some time charging them in a café and then went to the official Ice and Snow World. We got there after sunset and I’ve never seen anything quite like it. The area was huge, surrounded by a giant ice-brick wall. If It hadn’t been so cold, you could have easily walked around for a few hours. I liked to estimate how many stories some of these sculptures rose but I can’t say. At least 3-4 for some of them. Every year, the theme is different. This year, they created replicas of famous buildings around the world. They had the Burj Khalifa, the Coliseum in Rome, the Forbidden City, castles, cathedrals, a post office, a bell tower with a real giant bell, Angkor Wat. They even had a weird area they let some intern turn into something from a video game. 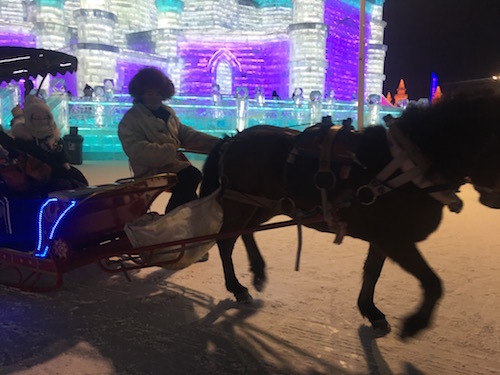 There was a train, slides, and, even in the land of magical ice sculptures, you still had to jump out of the path for speeding sleighs pulled by horses and little carts zipping by. 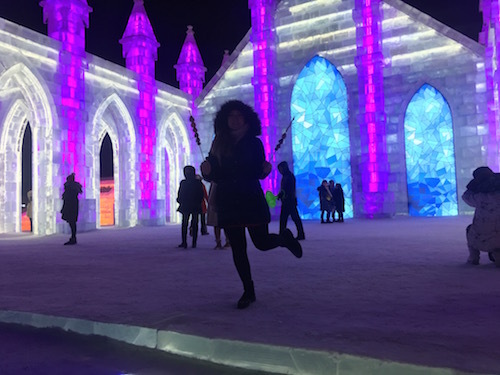 I really didn’t think the ice sculptures would be as good as they were. They definitely exceeded my expectations and I can’t say I’ve ever (or will ever) see anything quite like that again. If it hadn’t been for the piercing cold causing my toes and fingers to ache and making my phone battery run down to zero, I would have stayed all night. 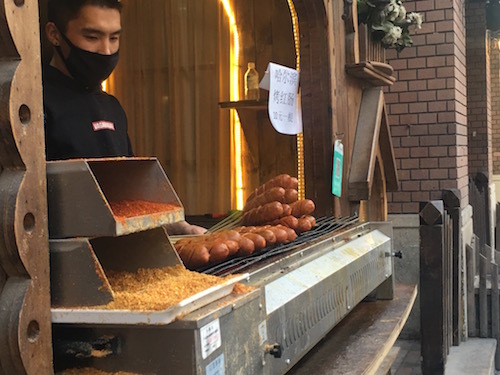 Alas, we got a taxi and warmed up over more BBQ at a little place up a sketchy staircase that I can’t image any foreigner had ever stumbled into before. Once again, Antonio saved the day with his Chinese and overfed me until my stomach hurt. 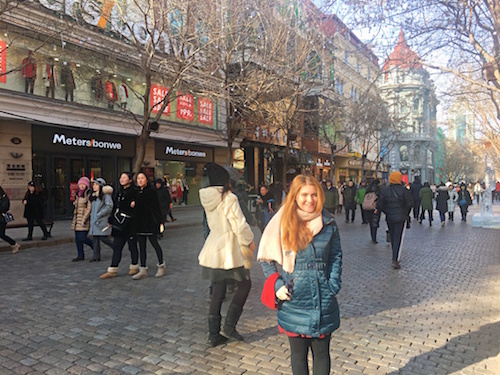 Our last day, we mostly just walked around Harbin. Antonio took me to try the other food the northeast is famous for which I actually preferred over the BBQ. 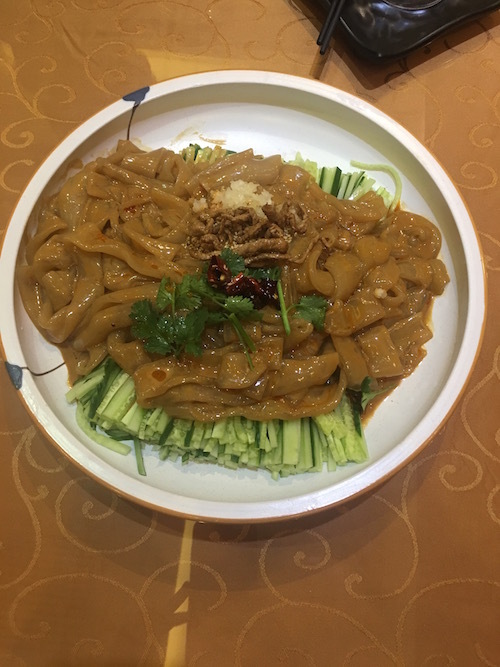 One was a giant bowl of cold noodles and vegetables with a ginger sauce, the other a mound of lightly-fried pork with a sweet sauce. The photos don’t do justice to how much food this was. 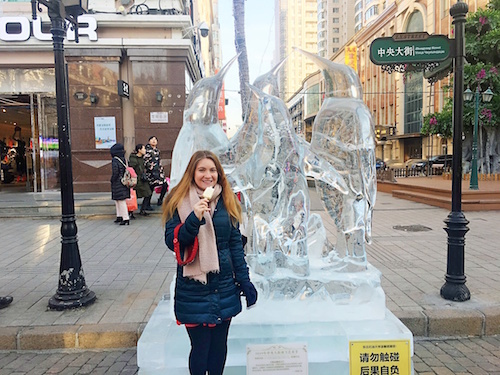 We walked around a small park with little ice sculptures and walked through a street market back to the first BBQ place. Despite being sufficiently stuffed, Antonio wanted to eat more before we headed back to the airport. Harbin was the first place I’ve been in China outside of Beijing. 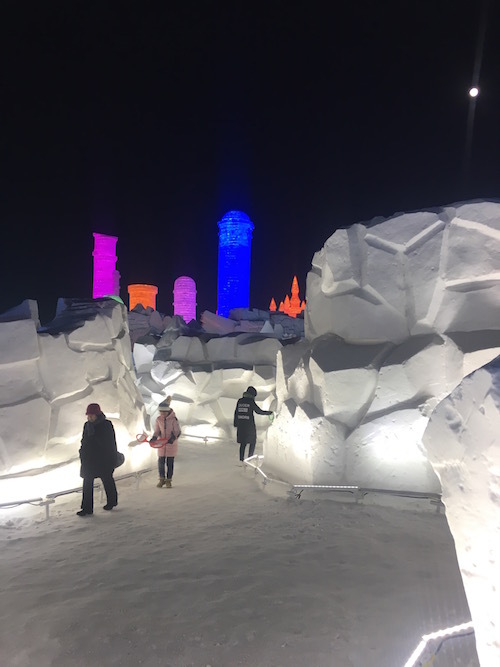 Part of me truly appreciated the ice festival but I think half the reason I liked Harbin so much was just being out of Beijing finally. 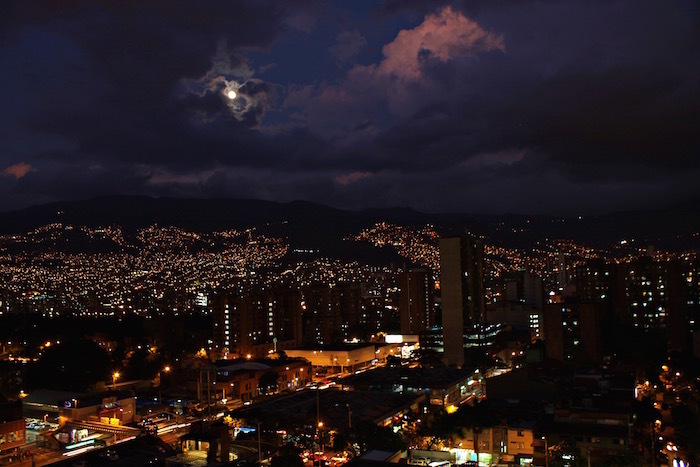 Fantastic photos. I wouldn’t have lasted a minute in all that cold though. 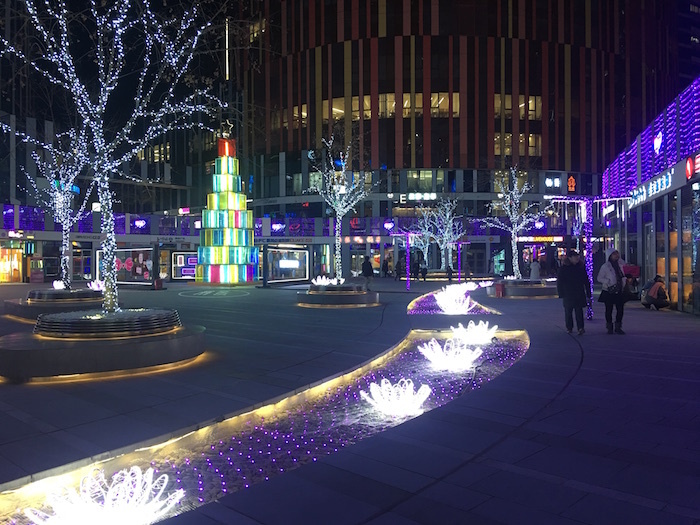 Wow it looks wonderful! I don’t think I would have lasted long. Neat! 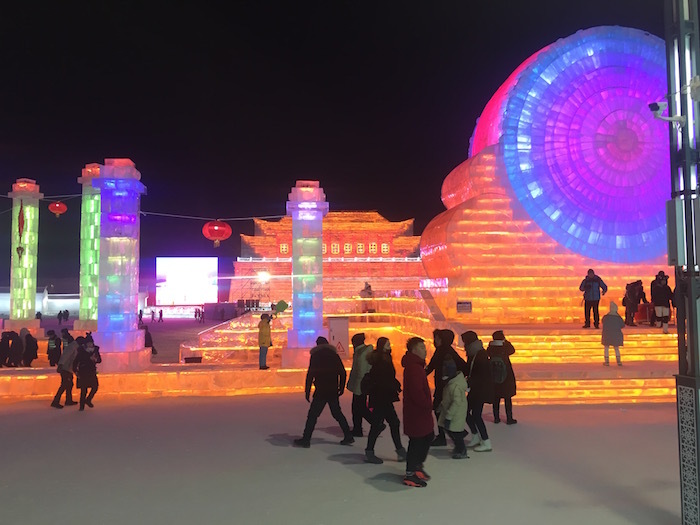 Any info about the ice sculptures themselves: how and by whom they are created, how long it takes, etc. ?